This is a tutorial post. If you need just the solution you can jump at this topic, but I strongly recommend you to read the introduction. One of basic test automation architecture item is know when your test fails and have a kind of evidence of it. Commonly we use, for front-end tests, a screenshot to show where the error ocurred. Mainly the screenshot name is the test name. Some people add date and time to track this information, but for parallel execution we need to add more information on the screenshot name. The example will show an Appium test script developed with Java and the usage of TestNG to facilitate the approach to capture a screenshot. In my case, that I'll save a file in a directory, I need to call the getScreenShotAs method from driver, an pass the parameter OutputType.FILE. After use the FileUtils class from Commons IO to copy our file (screenshot) to a physical directory. Basically you'll add the lines above to some strategy on test failure. The basic one it add it to a try-catch block. It's "ugly", but it works. The problem with this approach is that you need to add this block in every testcase (automated script) and, depends how many tests you have, it is a lot of work. And remember DRY. If you running your test in parallel a solution about how you will differentiate the screenshot file name. Using the approach to give the test class name or test name will cause a file override. Using the approach adding the date and time will cause a manual work to see which device that screenshot belongs. In TestNG you can implement some listeners to modify TestNG's behavior. This interface (ITestListener) have a method onTestFailure that will be called every time your test fail. So we have the listener to add the screenshot generation. It's easy to add a screenshot on test failure. Just add the screenshot code (you have seen this above) on the onTestFailure method! But you'll face the same problem I had: how to capture the driver object to use in the getScreenshotAs method. With the iTestResult information (coming from the parameter) you can access the test class where the error occured. Basically it's a reflection. Basically you need to get the class, get the field (the driver) and the value of this field (driver instantiated). The driver is on the test, and not on a base class or something related, because of the paralellism. Now you just need to add the code for capture the screenshot. We're almost there! Simply add an annotation @Listeners passing as parameter you custom listener class. Now every time your test fails, and screenshot will be taken. Now, for the complete example, we need to solve this problem. As we use parameters on the test to execute the same test on different devices a trick is add these parameters on the screenshot file name. It's also a good practice (or recommended practice) to add the test class and test name on the screenshot file name. 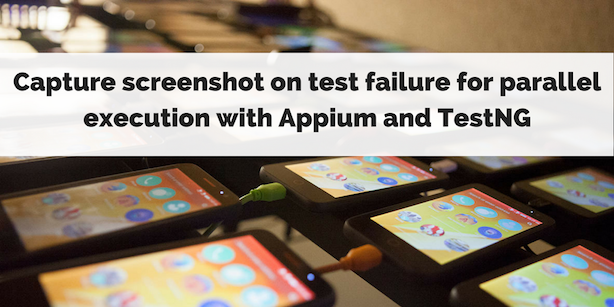 You can see a complete example, with the basic architecture to execute parallel tests with Appium and this trick to create screenshots on test failure.